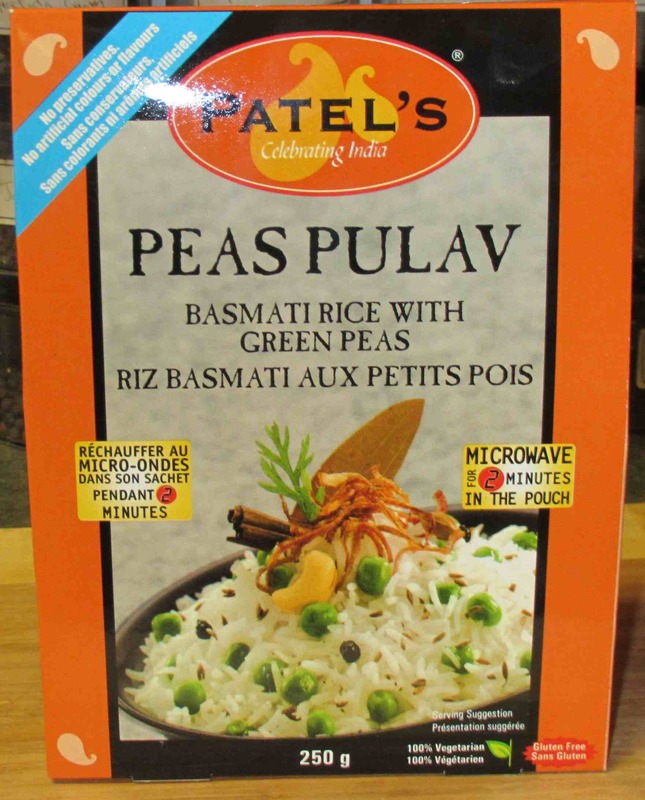 The ‘Peas Pulav’ you see above looks quite good on the box and is described as a rice dish ‘made with green peas spiked with cumin’. 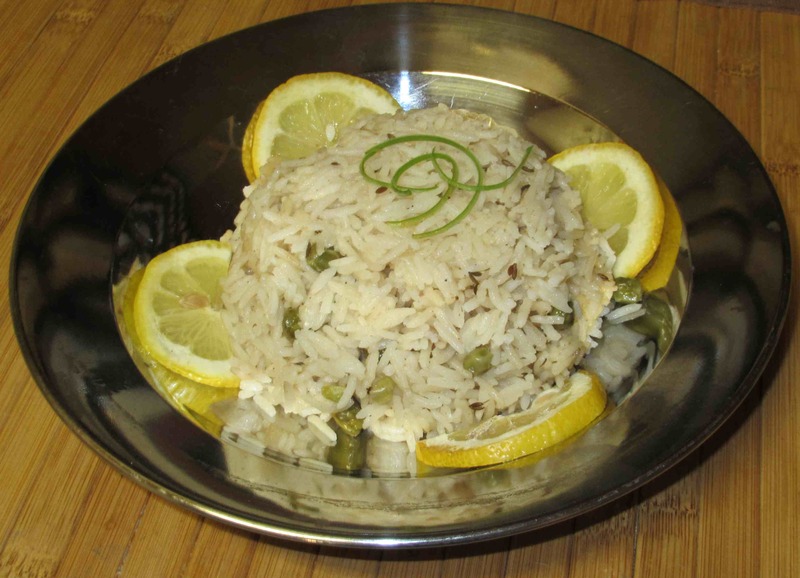 A Pulav, as is also mentioned on the box, is more commonly known as a ‘Pilaf’ and the combination of peas, cumin and rice is one I often cook. All the Patel pre-cooked meals we tried are intended to be cooked in the microwaveable packet contained inside the box. However, although this is supposed to be convenient, I know from bitter experience that the packets are very difficult to handle when they are hot. While the rice probably wouldn’t be too tricky, many of the meals, especially some of the more liquid preparations, are darned hard to spoon out when they are fresh from the microwave. Accordingly, I am going to do with this product as I have done with others and empty the contents into a suitable cooking container first. Well, I have to say that the contents of the packet are not quite as appetizing as they appear on the package illustration. 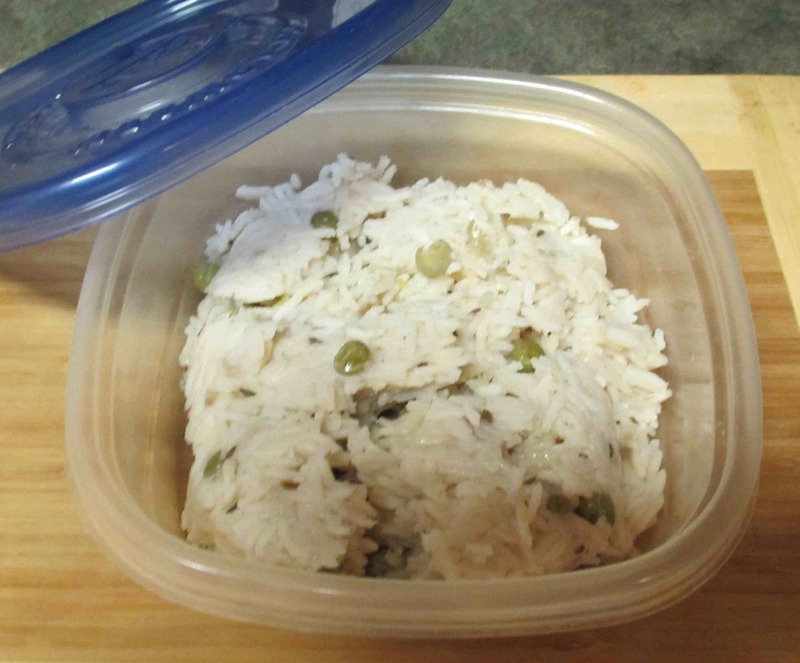 The rice looks fine but the peas are definitely not the pretty bright green they ought to be. The aroma is nice though, and even cold the sharpness of the cumin is readily apparent. packaged Pulav…has a bit of an “eeek” factor for me. From “the wife”: Actually it was John’s home made curry sauce that went with the prawns that, when mixed with the rice, made it really decent. By itself, as he said, mediocre. Appreiate your honest review of the product. It was curiosity more than anything … I have one other package I’m going to post about… it was actually not that bad, but not great either. So often the way with ‘convenience’ foods! Thanks for the review. I do prefer to make my own and usually the reason is I know exactly what is in it. As with living in different countries and not having everything in our native tongue ingredients sometimes it can get lost in translation. I always wondered about these instant sides. I agree with you: is making the real (and better) thing really that much more time consuming? Plus you don’t have to worry about how to open the steaming bag without injury because there is no bag!